As most of you know, 2017 was one of our best seasons on-track to-date. While we didn’t close it out with a national championship (which, at the beginning of the season wasn’t even on the radar), we did check a couple huge wishes off of the proverbial bucket list, namely: top prize at the K&N Spring Fling Million, and earning my first NHRA national event double in Chicago. Those were highlights of a season that had some other great moments, and really not many low-lights! At the conclusion of my September column, I had resigned myself to the fact that I would not win a third NHRA national championship in 2017. My #offmyrockertour took me all over the country in a few short weeks, but my dreams of championship glory essentially ended when I was defeated in the second round of Super Comp in Noble, OK and when Austin Williams went on to win the same event. That conclusion freed up the next weekend of my schedule. I was essentially eliminated from championship contention, which meant that I no longer needed to journey to Reynolds, GA for my final Lucas Oil Division Series claim. You’d think after a non-stop 8-week journey to all corners of the country, I’d be ready for a week off prior to closing out our season at the Million Dollar Race. As you’ve probably surmised over time, I don’t have that much sense. The options for the weekend were either a big buck event in Huntsville, AL, or a couple of $5k races in Clay City, KY. I figured that Huntsville would be packed; it was a good race, the week prior to the Million. I didn’t want to deal with 300+ cars, so we elected to head to Clay City instead. At Clay City, as it turned out, they actually HAD 400+ cars. So much for that logic (Huntsville had under 200)! The goal of the trip was to make some wide-open runs in my Corvette, something that I hadn’t done since the Spring Fling Million back in April. I rolled out with a 4.87 on my first hit, and things were looking up! In the end, Jessica and I managed to get completely skunked in Clay City. That’s right: we didn’t turn on a win-light. Not one! 0-6 on the day, and we were headed back west to Illinois! Worst of all, after a couple nice laps, my last run in the Corvette was a disaster: in three years, it’s never really made a bad run. When I let go of the button in round two, it tried to hit everything on the race track! I returned home without a lot of confidence. Upon further inspection, however, I realized that the anti-roll assembly had essentially fallen apart (give me a D- for maintenance and upkeep on that one)! After a call to Charlie Stewart and a next-day shipment to Montgomery, I felt good about the Million once again! The Corvette ran a 4.78 at 146 MPH on Wednesday night. That… was… FUN!!! I did manage to drive it into the sixth round of Friday night’s $25-grander before I got the bright idea to bump down a .00 reaction time. The first two rounds of the Million couldn’t have gone better: Jessica and I shared three entries, and we emerged unscathed from rounds one and two: 6-0! On the last day, I was still in contention in my K&N Filters Dragster with 32 cars remaining when the rains set in and the remaining entrants split the purse. On the down side… After those two awesome rounds in the Million, the wheels came running off for Jessica and I. I started round three with an atrocious run in my Corvette (can you believe that .020 and .01 above didn’t get it done??). Then Jess bumped it red. No worries, we still have the K&N Dragster, the best car on the planet, left in competition. And I laid down a .013 package with it that round. But all that got me was a Hughes torque converter for the best losing package of the round, and a trip to the annual cookout (thanks again to chef Anthony Bertozzi) to think about what could have been. On the weekend in my dragster, I lost three rounds of competition. The WORST package that beat me was .011. Yea, they were pretty rough on me! In the ‘vette, on the other hand, I was at the right spot in line more often than not, I just failed to capitalize. As for Jessica, I was proud of her performance: she stood toe to toe with the best in the business on the biggest stage in bracket racing (this was the first time that she entered the Million itself), but she came up on the short end of close races most of the weekend. While we didn’t have the on-track success we had hoped for at the Million, I’d like to think that we looked pretty good trying! Thanks Jeannie Lewis for the photo. For the last twenty years, I’ve ate, slept, and breathed drag racing. For the last 10+ years, I’ve made my living behind the wheel. Without exception, the most enjoyable portion of that has come in the last 4 years: since my wife left her teaching position, she and our son Gary have been with me, with little exception, at every race I’ve attended. It’s been absolutely incredible; to have the opportunity to make a living doing something I absolutely love, and to be able to share it with the people closest to me. I’ve been very fortunate, and it’s got me very spoiled. Spoiled, to the point, where I can’t see it being much fun to race at that level (or more appropriately, that pace) without them. Gary will start kindergarten in August. As a former public school teacher herself, my wife and I are advocates of the public school system (we don’t want to homeschool). He’s only going to be young once. I want to be here when he needs me. I want to coach his ball teams. I want to attend his school performances and support him: both emotionally and physically in whatever it is that he develops a passion for. At this point in my life, that’s far more important than chasing championships or racing 40+ weekends a year. 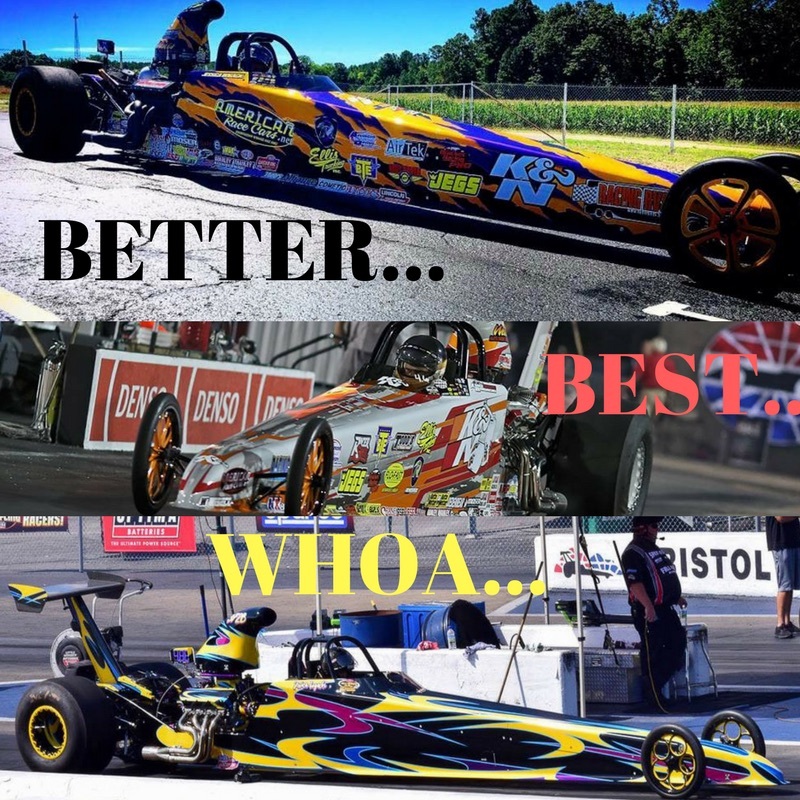 Plus, as much as I love competition (and believe me, I still LOVE drag racing and competition), I’ve built a program that is honestly more than I can handle. 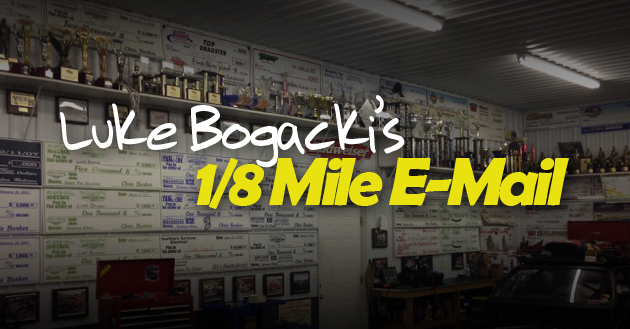 Keeping up with five race cars, two haulers, and all the commitments that come with it is a full-time job. 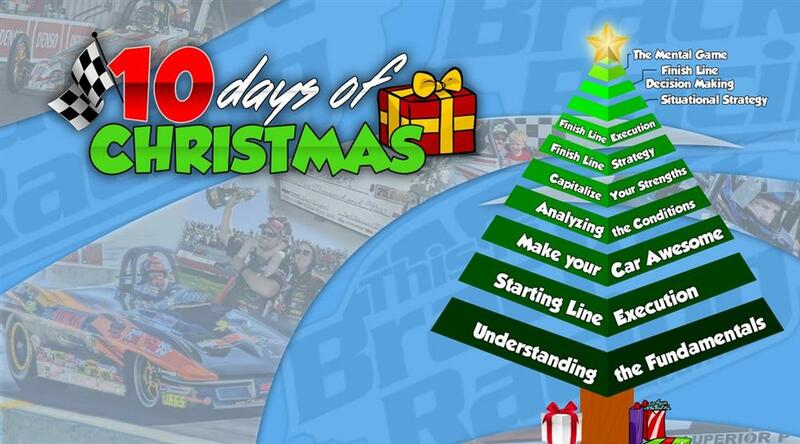 And, on top of family commitments, ThisIsBracketRacing ELITE and the Sportsman Drag Racing Podcast are essentially full-time jobs in their own right. Something has to give. I’m excited about the business opportunities that lie ahead as much as I am the personal ones. With that in mind, it’s not like I’m going to drop off of the sportsman drag racing radar. Jessica and I will still race, and you’ll still see me at some of the biggest events. Indy and the Million Dollar Race still get my blood pumping: I can’t imagine missing either one! But with the exception of a handful of events like those, our show will stay a lot closer to home. We’re fortunate geographically speaking, to live in a bit of a hot bed for big buck and NHRA class competition. When we feel like racing, we’ll be at the best event available within 4-5 hours of home. When we don’t feel like racing, we won’t. Simple as that. So, with that in mind, shortly after the Million, I sent our coach back to Racing RV’s. By form of a mutual agreement, we’ll no longer use and display their selection of used RV’s at events across the country. 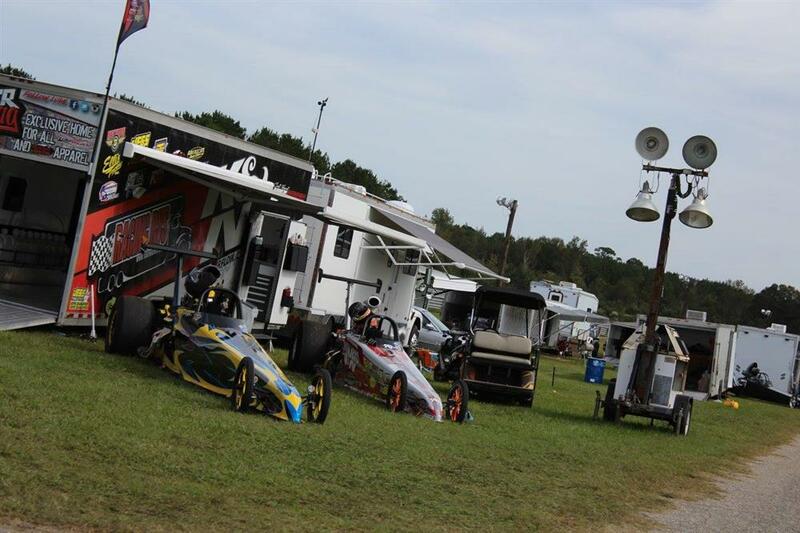 We’ll still be affiliated with Racing RV’s in some manner, but it doesn’t make sense for either of us to keep an RV for a handful of big events each season. In addition, we’ve sold our Racing RV’s backed, Charlie Stewart Race Cars built Corvette. It has found a good home back in Texas (near where it was born). At this point, we still have three dragsters, which ultimately is two too many. Eventually, I’d like to have one of our American Race Cars dragsters, along with my trusty Vega. Many of you have been asking about our progress on the Vega. Admittedly, it’s coming along slower than I’d like, but it is coming along, and it’s going to be awesome when it does hit the track again (hopefully some time in 2018). You can follow the latest Vega developments on my Project Vega Resurrection Blog: http://www.thisisbracketracing.com/blog.cfm. I recently purchased a nice dually, and a smaller Gold Rush (non-stacker) trailer to form what I hope to be a very nice, but very manageable setup that we’ll compete from for several years to come. 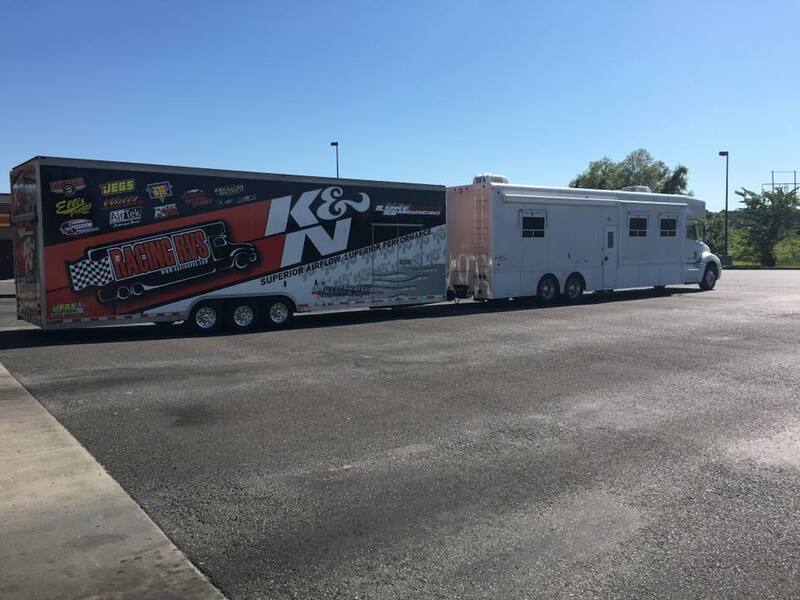 In addition, we’ll be looking to sell our Gold Rush Stacker trailer (it’s set up to haul four dragsters, and it’s loaded: electric awning, engine changer, tool box, loft storage, lots of cabinets, AWESOME trailer). I haven’t advertised it yet, but if you’re interested, just give me a call or shoot me a message. Thanks again to everyone for reading: whether you’ve been reading my ramblings for the past 15+ years, or this is your first On The Road. I hope you all have a great offseason, and enjoy quality time with your family and loved ones this holiday season!